Since graduating from Plymouth, I relocated to South Africa and started managing a small SPCA branch in a rather rural and underprivileged area. I loved this work because of my passion for animal welfare, but it is hugely taxing and distressing. I stayed at the SPCA for one year and then moved to Plettenberg Bay where I worked at a wildlife awareness and rehabilitation centre. We admitted anything from tortoises and meerkats to caracals and antelope! This was a very fulfilling role and I learnt a lot! It was here that I met my first African penguin patient, which became the start of my seabird career and my love for birds! I started driving the penguins to Cape Town where they would be rehabilitated at the world-renowned seabird centre SANCCOB, famous for the biggest animal rescue in history when they rescued 19, 000 oiled African penguins when the MV Treasure ran aground off the coast of Cape Town in 2000. Soon after, I transferred to Cape Town and became the rehabilitation manager. That was six years ago and my passion for saving seabirds and conserving our marine environment grows deeper every day. Dealing with people! I have definitely lost faith in humanity working in this field and seeing what humankind is responsible for. Then, my faith is restored (a little bit, anyway) when amazing people sign up to work at SANCCOB. I have met some of the most wonderful, caring people there! The most exciting adventure was arriving in Botswana during my gap year. It was a culture shock! I had the most amazing wildlife experiences; working with cheetahs, wild dogs, martial eagles, and experience human-wildlife conflicts. 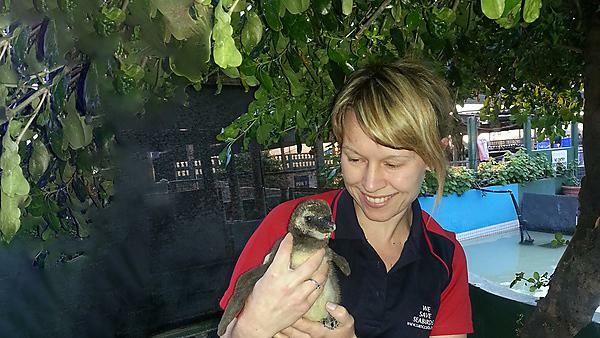 The more recent highlight in my career is viewed as pioneering conservation work, where we hatch African penguin eggs and, after rearing, release them into the wild. I am also working on acquiring a captive population of endangered Bank cormorants (in partnership with Living Coasts). Definitely take a gap year and try to experience something that you are passionate about. Volunteer or intern at first if you have to; it’s often tricky to get into the wildlife conservation field when you don’t have experience. So demonstrate that you are serious and it will be noticed! The best advice I can give is to do what you love, because it gives you peace and fulfilment. It gave me my confidence back. I wasn’t a natural academic but I persevered and received the necessary help and support from the lecturers (especially with statistical analysis!). Yes, I would recommend taking a course at Plymouth University because they have great support staff and an effective placement programme. The BSc (Hons) Animal Science (Behaviour and Welfare) course is a broad and detailed course. Do your Honours project! It’s hard work at the time but worthwhile, especially when you are ready to do a masters later down the line. For more information about our range of courses within the School of Biological and Marine Science, please visit the school page.